The landmark guide to internal medicine- updated and streamlined for today's students and cliniciansA Doody's Core Title for 2017! All eChapters in the Nineteenth Edition are accessible online as well as on the DVD packaged within the print volumes, so you have the flexibility of using the method of access most convenient to you. 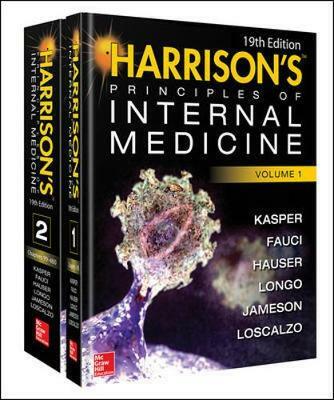 Through six decades, no resource has matched the authority, esteemed scholarship, and scientific rigor of Harrison's Principles of Internal Medicine. Capturing the countless advances and developments across the full span of medicine, the new 19th edition of Harrison's provides a complete update of essential content related to disease pathogenesis, clinical trials, current diagnostic methods and imaging approaches, evidence-based practice guidelines, and established and newly approved treatment methods. Here are just a few of the outstanding features of the new Nineteenth Edition: Presented in two volumes: Volume 1 is devoted to foundational principles, cardinal manifestations of disease and approach to differential diagnosis; Volume 2 covers disease pathogenesis and treatment NEW chapters on important topics such as Men's Health, The Impact of Global Warming on Infectious Diseases, Fatigue, and many more Critical updates in management and therapeutics in Hepatitis, Coronary Artery Disease, Ebola Virus Disease, Multiple Sclerosis, Diabetes, Hypertension, Deep Vein Thrombosis and Pulmonary Embolism, Acute and Chronic Kidney Disease, Inflammatory Bowel Disease, Lipoprotein Disorders, HIV and AIDS, and more. Increased number of the popular Harrison's clinical algorithms; clinically relevant radiographic examples spanning hundreds of diseases; clinical-pathological images in full color; crystal clear, full color drawings and illustrations and helpful tables and summary lists that make clinical application of the content faster than ever Access to outstanding multi-media resources including practical videos demonstrating essential bedside procedures, physical examination techniques, endoscopic findings, cardiovascular findings, and more Supporting the renowned coverage are supplemental resources that reflect and assist modern medical practice: more than 1,000 full-color photographs to aid visual recognition skills, hundreds of state-of-the-art radiographs, from plain film to 3D CT to PET Scans; beautiful illustrations that bring applied anatomy and processes to life; the renowned Harrison's patient-care algorithms, essential summary tables, and practical demonstrative videos. In addition, the book's several digital atlases highlight noninvasive imaging, percutaneous revascularization, gastrointestinal endoscopy, diagnosis and management of vasculitis, and numerous other issues commonly encountered in clinical practice. Acclaim for Harrison's: "Covering nearly every possible topic in the field of medicine, the book begins with a phenomenal overview of clinical medicine, discussing important topics such as global medicine, decision-making in clinical practice, the concepts of disease screening and prevention, as well as the importance of medical disorders in specific groups (e.g. women, surgical patients, end of life). The extensive chapters that follow focus on a symptom-based presentation of disease and then illness organized by organ system. Numerous tables, graphs, and figures add further clarity to the text. The accompanying DVD includes extensive video and image collections of pathology, histology, procedures, additional lectures, and radiology... ...Written by experts in the field, this book is updated with the latest advances in pathophysiology and treatment. It is organized in a way that makes reading from beginning to end a logical journey, yet each chapter can stand alone as a quick reference on a particular topic. "